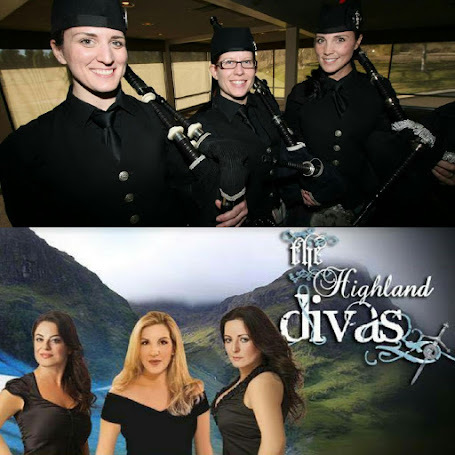 If episode 6 took a couple of detours from Diana Gabaldon’s words, episode 7 forged a whole new highway. The majority of the episode consisted of ‘written for TV’ scenes, while many of the moments that were taken from the book were significantly altered. The acting was stellar as usual, so for TV only viewers, the result was an action packed ride. For some book fans however, it was a challenging 50 minutes, while others were more successful in putting the book down and enjoying the differences for what they were. 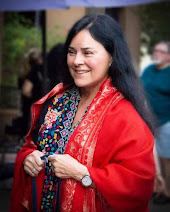 It is interesting to note though, that Diana Gabaldon weighed in on the Compuserve forum to express her displeasure at a couple of decisions - usually a good indication that something major had been done to the original source. After a title card which hints at some fiery drama to come, the episode begins exactly where episode 6 left off, with Claire defending herself against the intruder who has entered their room in the brothel. After being thrown onto the bed, Claire grabs a knife from the bedside table and lunges at the man, succeeding in cutting him. Angered by this, he tells Claire he isn’t going to bed her, but kill her instead, laughing at her wild slashes to keep him at bay. He ducks out of the way of her final lunge and loses his footing, causing him to stumble backwards. He falls, smashing his head on the hearth as he does so and lies still, just as Jamie enters the room. 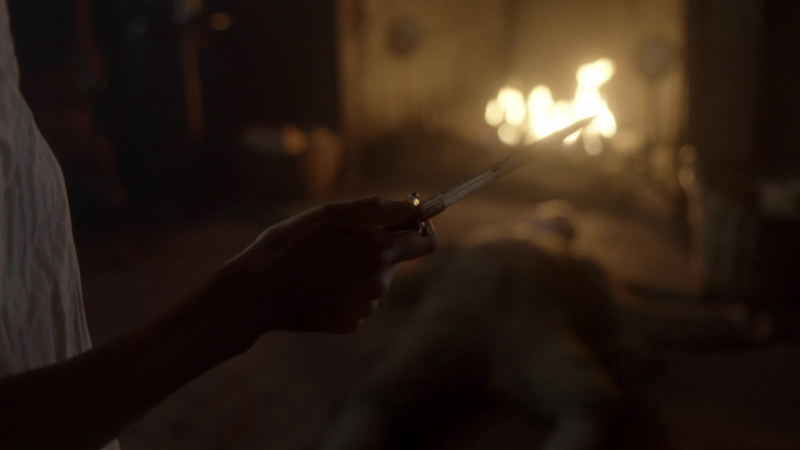 Taking the knife from her trembling hand, Jamie asks what happened. 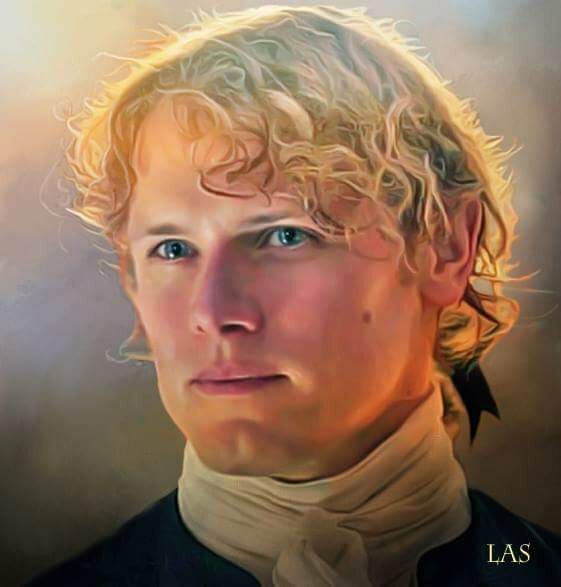 Claire explained that when she returned to the room from her chat with the ladies downstairs, she had found the man rummaging through Jamie’s things, looking for his ledgers. But before Jamie has time to process this news, the man takes a ragged breath and Claire realises that he is not, in fact, dead. Her doctor gene kicks in at this point and she flips from trying to kill her assailant to insisting that she try and save his life. 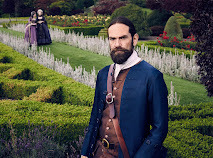 A knock on the door turns out to be Fergus and Madame Jeanne, who have rushed upstairs at reports of a struggle and Jamie lets them into the room. 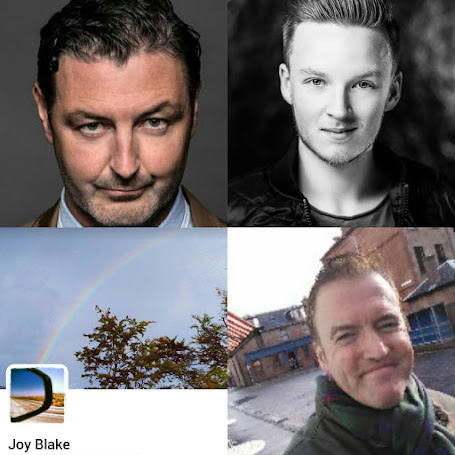 An examination of the man’s pockets reveals his identity to be John Barton, an exciseman working for Sir Percival. This is bad news, as it means that Sir Percival has indeed suspected that the whisky smuggling has gone beyond the local area and has employed Barton to discover the whereabouts of the extra casks, which currently reside in Madame Jeanne’s basement. Jamie muses that when Barton doesn’t return, Percival is likely to come looking for him and they will all be in danger. Jamie promises Madame Jeanne that no harm will come to her and that he will take care of the casks. She suggests that she send one of her discreet girls to clean up in the room, but Claire is insistent upon getting medical supplies to try and save Barton’s life. She asks Madame Jeanne to send the girl to the barber’s for a drill called a trephine and the older woman says that she will see what she can do. Jamie sends Fergus to gather the other men so that he can inform them of events. With Fergus and Jeanne gone, Jamie tries once more to dissuade Claire from attempting save Barton’s life, telling her that the man doesn’t deserve her mercy. Claire acquiesces, but only in as far as allowing Jamie to turn Barton over to the authorities once he has recovered. Jamie tries again: in the 18th century, Claire is likely to find herself arrested for assaulting Barton, given that she had been alone in a room in a brothel, with a man who was not her husband. The fact that Claire is not a whore, he responds to her indignant comment, would be immaterial. But Claire will not be swayed, and begins to dress in order to go to the apothecary. 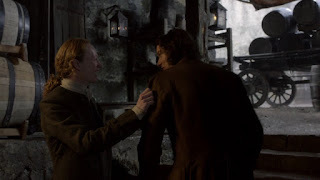 An obviously annoyed Jamie declares her to be “as stubborn as always”, and tells her that he has casks to get rid of, but that he will send a man up to watch over Barton while they are gone. Down in the basement, Jamie, Willoughby, Fergus, Young Ian, Lesley and Hayes are in the process of moving the casks. Willoughby declares his admiration for Claire in valuing the sanctity of human life, a comment that promptly earns him the job of watchman over Barton’s prone body. Meanwhile Lesley and Hayes can’t understand Claire’s decision at all, saying that they have always wanted to gut an exciseman. 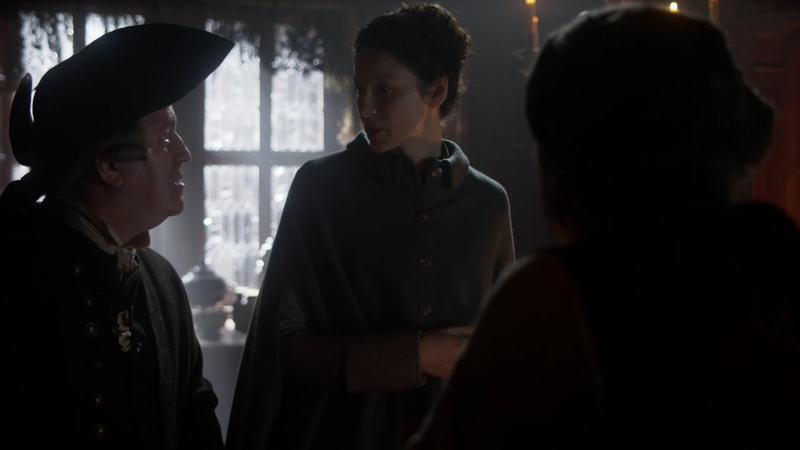 Fergus says that Claire has always been a unique woman, a comment that earns a wry chuckle of agreement from Jamie. Meanwhile Young Ian is worried about the print shop, fearing that Sir Percival will send men there as well. 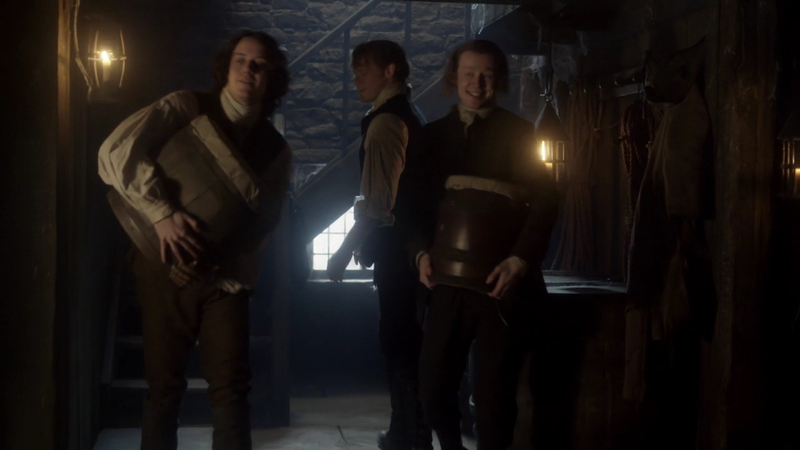 But Jamie is less concerned: he doesn’t keep casks at the shop, he says and Sir Percival doesn’t know about the pamphlets that are hidden there. 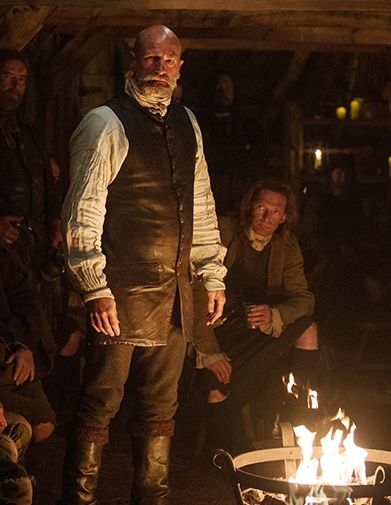 He entrusts Young Ian and Fergus with the task of selling the casks, even if it means taking a loss. Young Ian is delighted with this responsibility, promising his uncle that he won’t let him down. Claire arrives at the apothecary and attempts to jump the queue, telling her fellow customer that she is dealing with an urgent situation. The man proceeds to insist that his sister’s condition is no less urgent, prompting Claire to introduce herself as an experienced healer and offering to visit his sister later that afternoon. 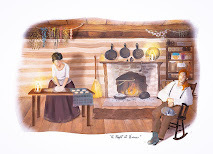 When she also agrees to do so free of charge, the man moves aside and Claire gives the proprietor her order of supplies. As she waits for them to be prepared, the man chats briefly about his sister, saying that she has a nervous complaint. Upon getting both the supplies she needs and the man’s address and name (Archibald Campbell of Carubbers Close), Claire hurries out of the shop and back to her patient. Ian and Fergus are negotiating the sale of the casks, trying to increase the price up from the 50 pounds that the buyer McDaniel initially offers. Ian suggests 75 and McDaniel counters with 70, commenting that without a Crown seal, he is the one taking all the risk. Ian repeats his price of 75 pounds, offering to throw in 3 casks of the creme de menthe as well. Not being one to pass up free liquor, McDaniel agrees, much to Fergus and Ian’s delight. 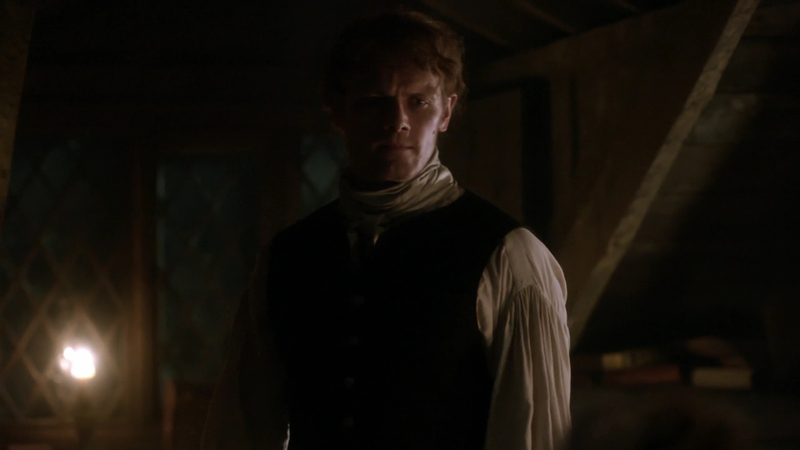 While they wait for McDaniel to send up some men to help move the casks, the two young men talk of Claire. Young Ian asks Fergus if he remembers her and Fergus replies that even though he had only been a boy, he remembered Claire well, describing her as being spirited and incredibly brave. 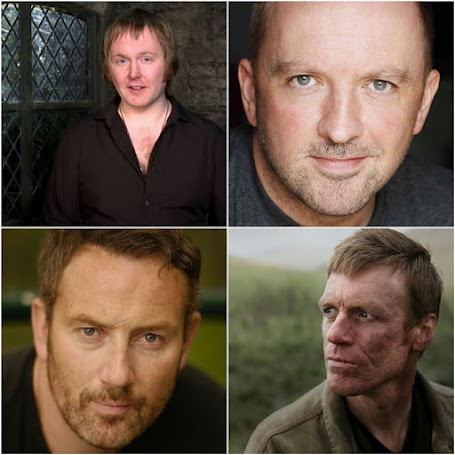 He tells Young Ian that Claire was fearless in the battles leading up to Culloden, healing men who had been virtually cut in half by swords or blown to pieces by canon fire without flinching. Fergus also speaks of the rumours that Claire had taken a few lives too and that she was not a woman to be crossed. But Young Ian remarks that if Claire had been forced to kill men, then they must have deserved it. Yet despite their mutual admiration, both agree that Claire’s recent actions have caused a bit of a catastrophe. That catastrophe is playing out upstairs in the next scene, as Claire returns to the brothel bedroom to find both Jamie and Willoughby trying to restrain a thrashing Barton, who is having a brief lucid interval and making considerable noise. Admonishing Jamie that Barton’s head must be kept still, she proceeds to dose her now patient with laudanum until he passes out again. Claire can see that the pressure of the haematoma is building and that she will need to operate. 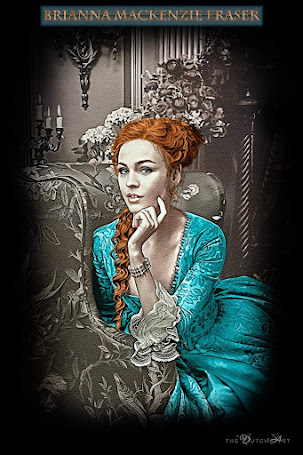 As she prepares to do so, a knock on the door from Madame Jeanne announces that Sir Percival has arrived to see Jamie. Jamie comes downstairs with Madam Jeanne in tow. Sir Percival is not impressed at Jamie’s suggestion that he has come for a midday romp, although his newly hired companion seems interested by the possibility. 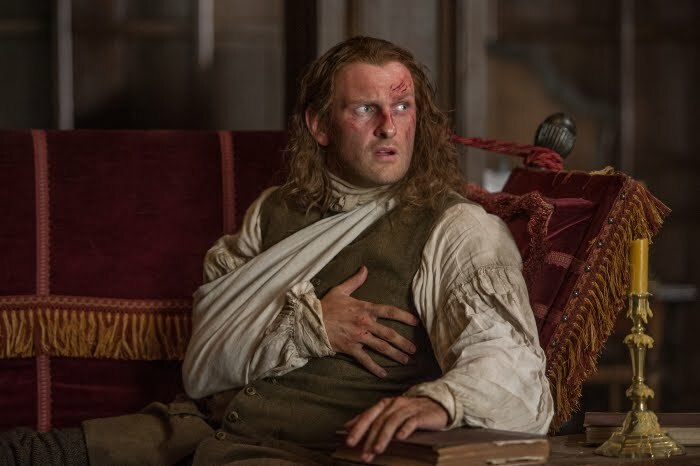 Sir Percival states that he there on business only and has come to search the premises as he believes Jamie to have been “withholding” from him. Madame Jeanne says that nothing is in the basement, but that he is entitled to look for himself. Reiterating that that is precisely what he intends to do, Percival and his henchman head downstairs, with Jamie and Madame Jeanne following behind, Jeanne giving Jamie an intensely nervous glance. 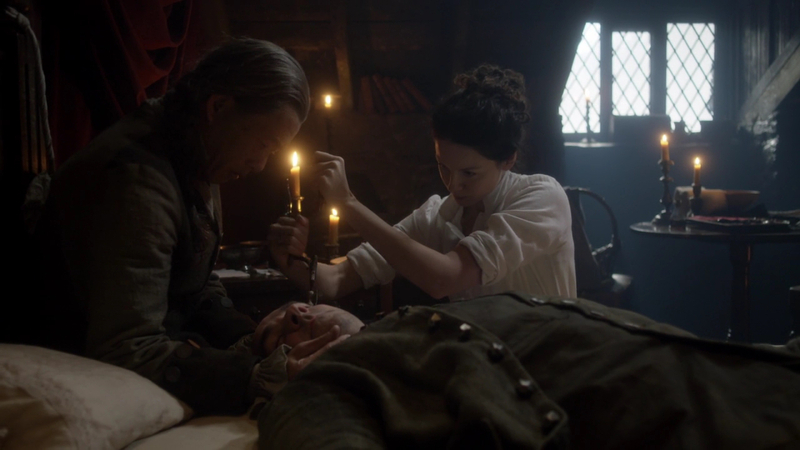 Willoughby is assisting Claire, watching intently as she makes an incision in Barton’s temple. As she prepares to insert and use the trephine, Willoughby asks if the drill will kill the man. Claire says that it won’t, but that the pressure in Barton’s brain will, if she doesn’t release it. She proceeds to drill into the skull until she is successful. Despite their extensive search, Percival and his companion can find no trace of the missing casks. At the sight of liquid on the floor, Percival asks if it is brandy. But his companion tastes it and declares it to be water, prompting Jeanne to state that the basement leaks, which is why she does not store anything of value down there. Dissatisfied, Percival leaves, telling Jamie that he will be watching him. Jamie returns upstairs, unnerved by the close call. He tells Claire that the attempt to save Barton must end now. Claire has her back to him and is cleaning instruments with Willoughby’s assistance. She responds that Barton is dead anyway, so Jamie has gotten his wish. Willoughby comments that Jamie’s honourable wife had fought hard for Barton’s life, putting her best foot forward. Jamie replies that he won’t grieve for the man who tried to kill Claire and sends Willoughby in search of Lesley and Hayes, so that they can move the body. 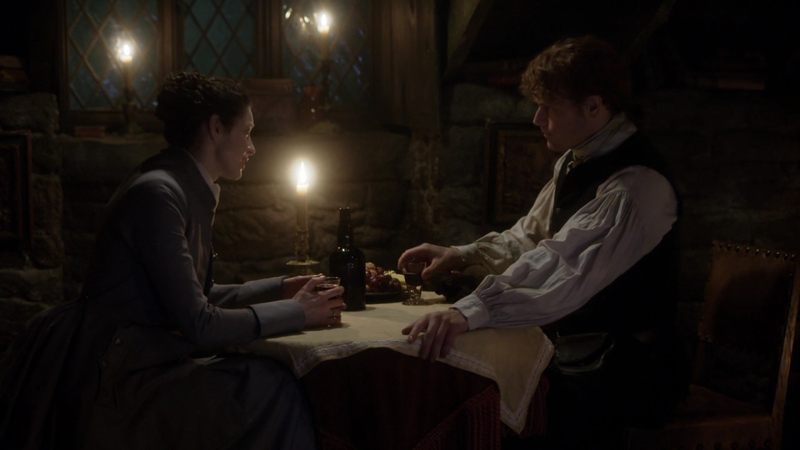 Left alone, Jamie and Claire discuss the situation. Claire tells Jamie that she doesn’t expect him to understand, but that since becoming a doctor, she has dedicated herself both to respecting human life and healing people without judgement. She works hard, she tells him, and doesn’t often lose a patient. Softening, Jamie tells her that she will have other chances to put her knowledge and skills to use and that there will be others to save. Claire softens too. She apologises for causing him so much trouble, for dropping in out of the clear blue sky, and putting both his livelihood and his life in jeopardy. 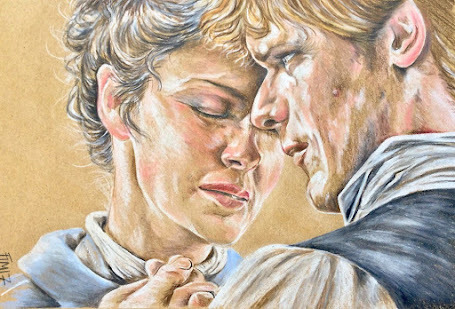 Jamie replies that she has travelled thousands of miles and 200 years to find him and that he is grateful she has returned, no matter the cost. Jamie tells her that he would give up everything he has for them to be together again. He has been living in the shadows ever since she left, he says, and it was only when she walked into the print shop that the sun returned and cast out the darkness. It is a beautiful tender moment, reminiscent of the speech that he made after their wedding, and played with customary sincerity by Sam Heughan, but it is short lived. Claire announces that she has another patient to see, explaining to Jamie that she had promised Archibald Campbell that she would call on his sister. 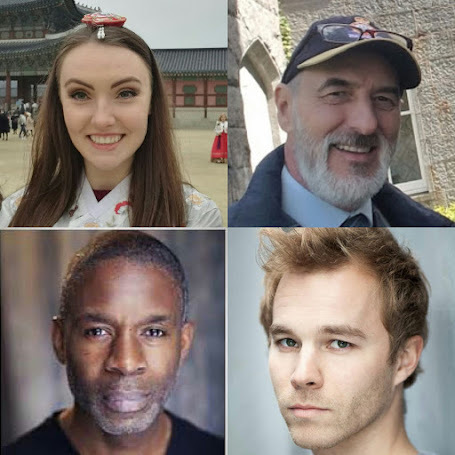 Pointing out that Claire doesn’t know who the Campbells are, Jamie insists that Fergus accompany Claire, worrying that Sir Percival might still pose a threat to her. But Claire reasons that Percival doesn’t know who she is, much less what she has done to the man who worked for him. If she can traverse thousands of miles and 200 years, then she can certainly get across town unaccompanied. Jamie gives up the argument, but asks only for reassurance that she will return when she is done. “Of course,” Claire replies, but there is tension between them now. The realities of starting again are beginning to hit home. Meanwhile, Young Ian and Fergus are celebrating their successful sale. Fergus congratulates his friend on his negotiating skills, saying that they made a good profit and that Young Ian has a natural talent for business, just like Jamie. Fergus suggests that the two of them should open their own business one day, but Young Ian is scarcely listening, his attention captured by the young barmaid, Brighid. Fergus has seen Young Ian admire the girl before, so calls her over to them. He tells his friend that tonight will be the night that he does more than just look. Ian is nervous, as he is a virgin, so Fergus prepares to give Young Ian advice on wooing a woman. After boasting of his own first sexual experience - a menage-a-trois at the age of 15 - Fergus tells Young Ian the secrets of the art of seduction: look deep into her eyes and tell the girl how beautiful she is; offer her a drink of whatever her heart desires and then continue repeating steps 1 and 2. Brighid appears at the table and Fergus departs, so Young Ian proceeds to follow Fergus’ advice, with immediate effect. Brighid smiles and tells Young Ian that she will have whisky. As Ian smiles back happily at her, he doesn’t notice the man watching him - it is Sir Percival’s henchman. Claire arrives at the Campbells, the death of Barton still obviously playing on her mind. 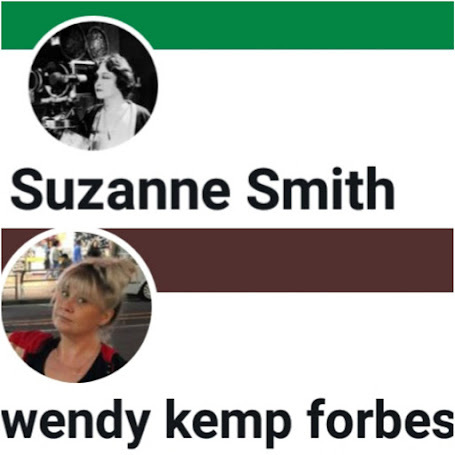 She is ushered into the room, to find a confused and obviously drugged Margaret Campbell. Claiming that he has given his sister laudanum to calm her, Archibald tells Margaret that he has brought a healer to see her. Claire touches Margaret’s hand and the woman rouses, fixing Claire with a piercing stare and giving a chilling warning that she will be devoured by Abandawe. As quickly as she came to life, Margaret becomes virtually catatonic again. Claire comments that her pulse is strong, but that Archibald should cease giving her laudanum as it is too potent for daily use. Deflecting, Campbell offers to translate Margaret’s vision for Claire. It then becomes obvious that they are a fortune telling team: Margaret has visions and Archie deciphers them for people, in exchange for a modest fee. Archibald tells Claire that in addition to his sister having trouble sleeping, she will also sit unresponsive for long periods of time. 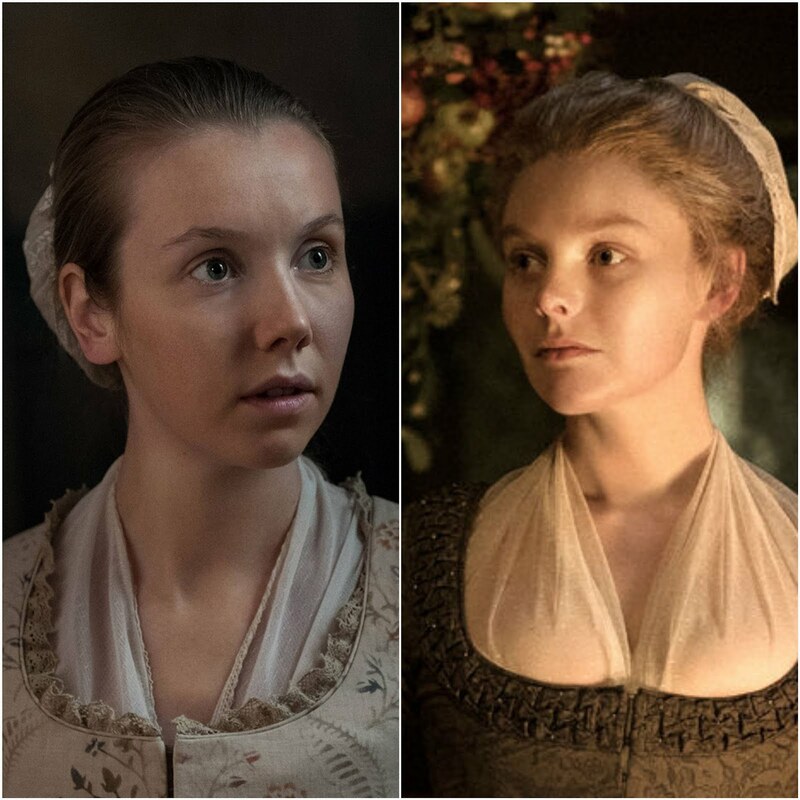 Claire comments that in her opinion, Margaret isn’t a seer, but suffering from a mental condition. Archibald doesn’t dispute this, saying that his sister has been soft in the head since she was a child. Claire begins to write down the ingredients for a calming tea, but Archibald disputes the tea’s ability to subdue his sister, stating that when she has her wits about her, she will run up to people and scare them with her visions. Claire asks if Margaret enjoys bring a seer and Archibald says that she does. 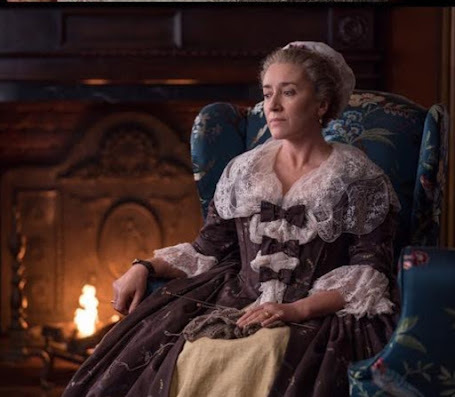 Claire tells him that she would like to return the following day, but the Campbells are off to the West Indies, as they have a wealthy client to minister to. Claire comments that such a journey would be an arduous one for Margaret, but Campbell replies that this is precisely why he wanted the laudanum. Claire reiterates that it should not be given and tells Campbell to make sure that his sister eats plenty of fresh fruit on their arrival in the West Indies. She takes her leave, but it is obvious that the visit has worried her: or perhaps it is because this is the second patient in a short space of time that she has been unable to help. Back at the print shop, a drunken Ian is serenading Brighid. It works, and the two begin to kiss. 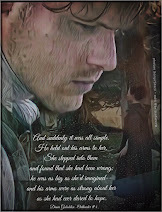 In an endearing parallel to his uncle Jamie’s inexperience the first time he slept with Claire, Young Ian similarly relies on the woman to show him how to make love, murmuring, “Tell me how you like it and I’ll do whatever you want.” Instructing him to lie down, Brighid tells him that she will show him. Jamie is counting coins when Claire returns. He tells her that Barton’s body has been hidden in a cask of creme de menthe. Alcohol slows the decay, he says, and since no Scotsman drinks creme de menthe, he doubts that Barton’s body will be found anytime soon. He dismisses the whole incident as nothing more than ‘a wee bit of chaos’. 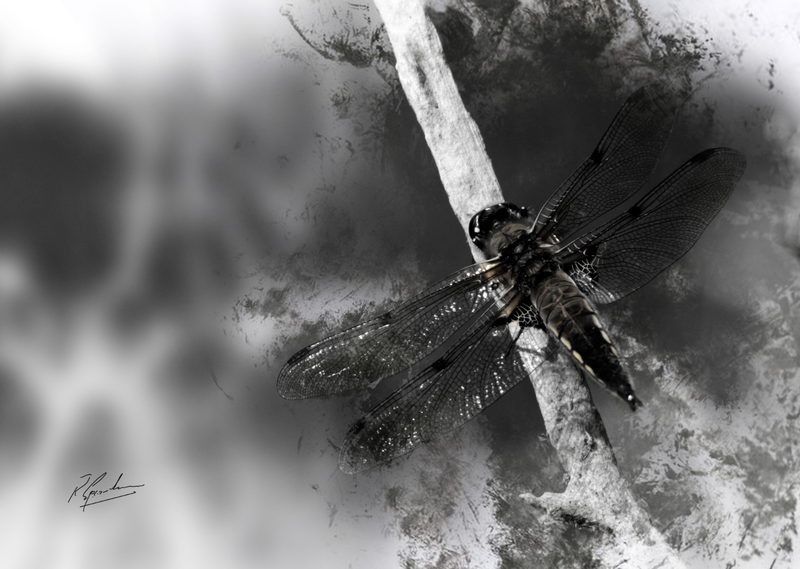 Claire suggests that the two of them find a place of their own. Surely Jamie hasn’t expected to make the brothel their home? Jamie responds that it won’t be forever, but for now, the brothel provides everything they need and, with true Scottish thrift, adds that there is no rent to pay. 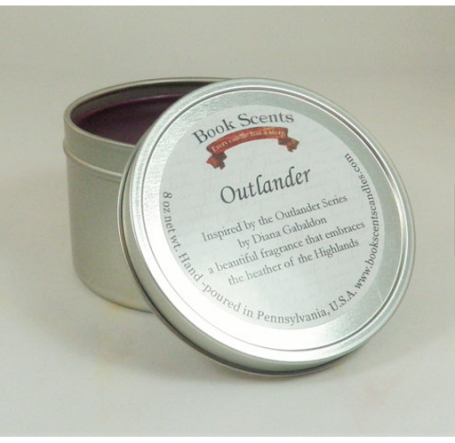 Claire tries again: perhaps she could make some money by setting herself up as a healer and working at the back of the print shop, or by opening an establishment of her own. In a parallel to France, where she had needed to feel useful, Claire admits to Jamie that it had felt good to have a patient and that the two of them could build a happy life in Edinburgh. But Jamie is saved from answering by a knock from Madame Jeanne announcing that a gentleman named Ian Murray is downstairs to see him. Claire is thrilled, wondering aloud why he is here. Jamie answers that Ian is likely as not looking for his son. He asks Claire not to let on that she has seen Young Ian and that he will explain later. Ian is looking thoroughly uncomfortable as whores parade around him, but his discomfort turns to shock when he sees Claire. Embracing her in disbelief, Ian tells Claire that he and Jenny had grieved for her for years. He asks where she has been all this time and Jamie and Claire proceed to retell the tale that Claire had used with Fergus: saying that each had believed the other to be dead after Culloden. Claire had sailed for Boston, returning once she had realised that Jamie had, in fact, survived. 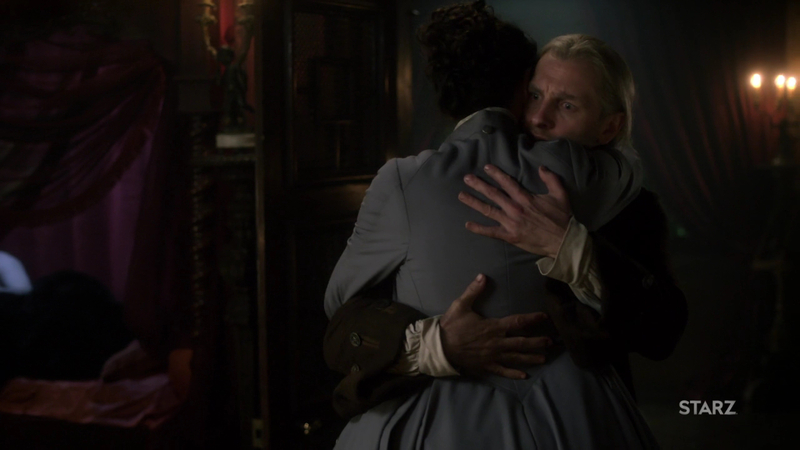 Jamie adds that he is more than happy that Claire had come back to find him. Changing the subject, Jamie asks why Ian is there. 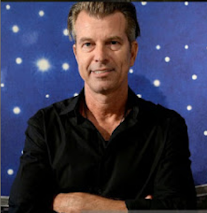 Ian replies that he is looking for his son, as it has been weeks since he ran away. 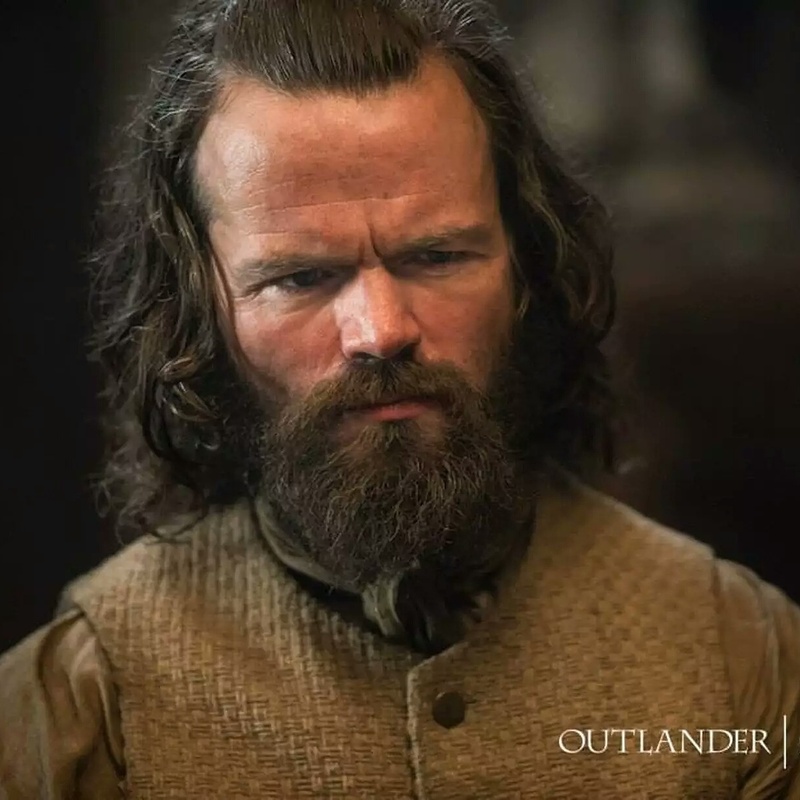 Ian wonders if Young Ian has come to find Jamie, as he had done in the past. Claire is shocked to hear Jamie lie, claiming that he hasn’t seen the boy in months. Jamie promises that he will bring Young Ian straight home if he shows up, and offers to walk Ian out so that he can continue the search. Ian agrees, but does not leave without telling Claire it is good to see her again. 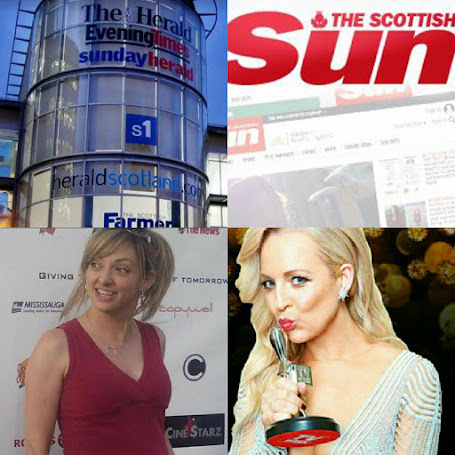 Claire responds by saying that she hopes to see Ian and Jenny soon. On the way out, Ian asks Jamie how Claire had taken his news. Jamie replies that he is yet to tell her and Ian advises that Jamie needs to do so quickly. Jamie agrees, but says that he has been waiting for the right time. 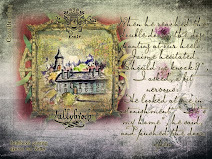 Ian comments that Jamie might be waiting forever for such a time, but Jamie responds by telling him that all will be well. Young Ian and Brighid are making love when Brighid hears a noise. Young Ian entreats her not to stop and they continue, until a louder noise reaches his ears as well. Reluctantly, they stand up and Young Ian is horrified to see a man in the shop. Telling Brighid to go, he confronts the man, asking what he is doing there. 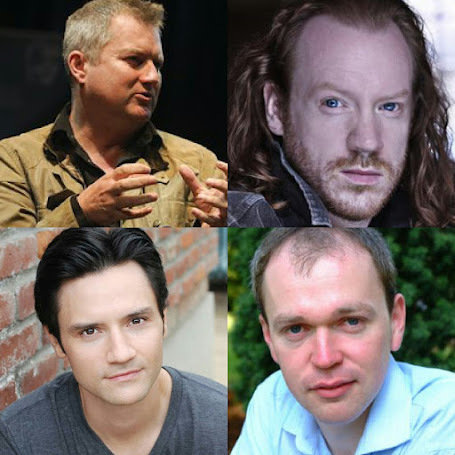 It is the man newly employed by Sir Percival, who tells Young Ian that he knows the boy is party to Jamie’s smuggling and asks where the casks are. Young Ian says that there are no casks and the two struggle, the man throwing Young Ian against the wood panelling which gives way to reveal the hidden pamphlets. Stating that Jamie has been busy, the man tucks a pamphlet into his coat, and says that doublecrossing Sir Percival is one thing, but that inciting sedition is another matter entirely. Desperately, Young Ian tries to get the man to leave, but he draws his pistol. He fires and the shot goes wide, exploding a bottle of accelerant which catches alight. Young Ian reacts by flinging hot lead from the pot into the man’s face. 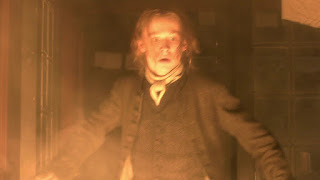 The man screams in agony and runs from the shop, but the fire is taking hold and Young Ian soon realises that he is trapped. Back at the brothel, Claire confronts Jamie over his decision to lie to Ian. Jamie says that he can hardly tell his brother-in-law that Young Ian has been helping with his smuggling business. Claire replies that he could at least tell Ian that he had seen his son, commenting that Jenny and Ian must be worried sick. Still, Jamie is unrepentant: Young Ian is safe, he says. 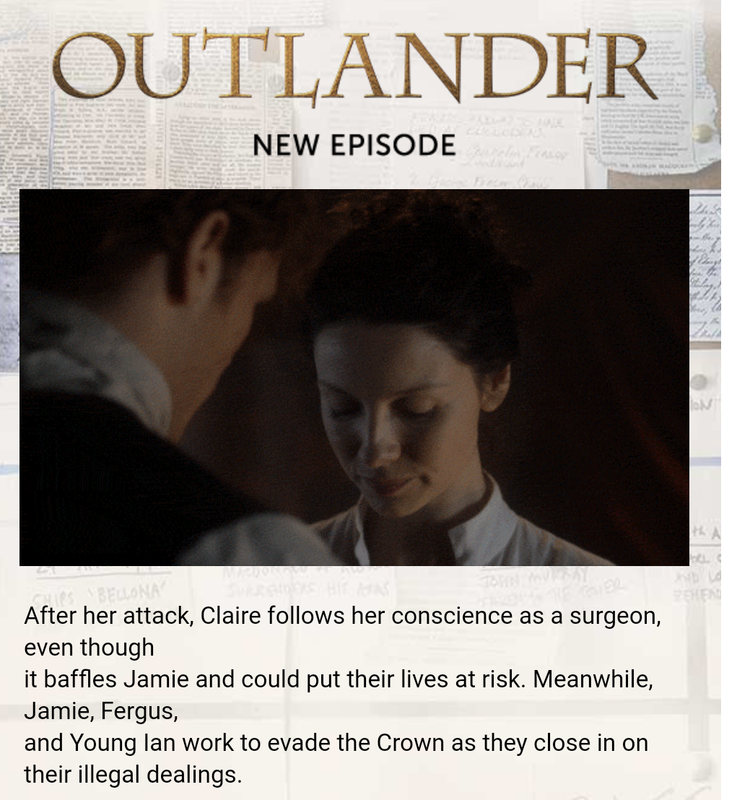 Claire disputes this, saying that Young Ian is, in fact, risking his neck for Jamie, without his parents’ permission. 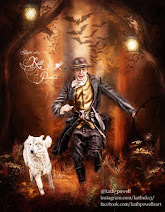 Jamie says that he did try to send him home twice but that the boy had returned and muses that it is better for Young Ian to be with his uncle than to be in a Godforsaken place surrounded by strangers. He adds that Jenny and Ian don’t know what’s best for the lad and that it is he who is teaching Young Ian the ways of the world. Claire is incredulous. It is not about the ways of the world, she says. Young Ian has run away and it is only natural that his parents should want to know where he is. Jamie has just lied and she doesn’t understand it. Jamie agrees that he has lied, but adds that Claire should not judge him for it. They have told many lies, he says, colluding their way through Paris before Culloden, to say nothing of the story that they have been telling to explain Claire’s reappearance. Claire dismisses this as a white lie, with Jamie responding that he didn’t realise that lies had shades. 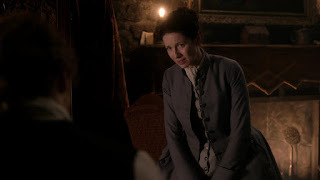 Claire admonishes him further, saying that Jamie has no idea what it is to be a worried parent, and reminding him that he is not Young Ian’s father. Jamie’s response is cutting. “No,” he tells her. “I’m Brianna’s father. But I didn’t get to raise her, did I?” Bitterness is on display here. Jamie comments again on the bikini from the photograph, the implication being that Claire and Frank had raised Brianna in an immoral fashion. 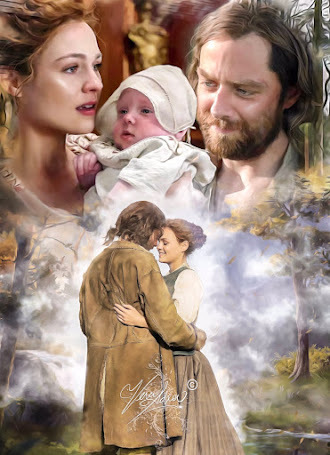 Claire asks if he would have preferred his daughter to be raised as a smuggler and a traitor, to which Jamie responds that at least her virtue would haven’t been in danger. When Claire comments that Frank had been a wonderful father to Brianna, we see Jamie’s jealousy ignite. He asks Claire if Frank had been a wonderful husband as well, implying that Claire had fallen in love with Frank again on her return. Claire tells him that she had cared for Frank and had loved him once, but long before she had met Jamie. The conversation is interrupted by Madame Jeanne who knocks on the door with distressing news: Carfax Close is on fire. This scene has been hotly debated on many forums since the episode aired. On the one hand, it certainly succeeds in showing that the romantic reunion between the two is over and that Claire and Jamie are now beginning the difficult business of trying to start their relationship again, with 20 years of different experiences, tragedies and relationships behind them. It is only natural that jealousies and insecurities would surface and that arguments would ensue. Sam Heughan and Caitriona Balfe are flawless in their portrayals and it is a sad scene to watch play out. The main criticism however, has been the change in the lie that Jamie tells to Ian. 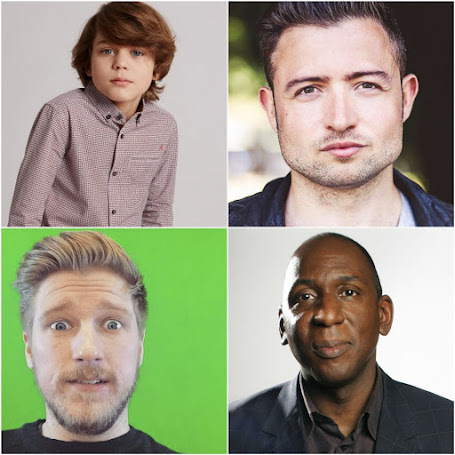 In the book, while Jamie also tells Ian that he doesn’t know where his son is, it is because he has promised Young Ian that he will let the boy tell his father in his own time. By deflecting Ian’s questions, Jamie keeps his word to Young Ian, which matches his personality as an honourable man. In this version though, Jamie seems to be lying merely to protect his own interests, so that Ian won’t find out that his son has been an intricate part of Jamie’s smuggling operations. 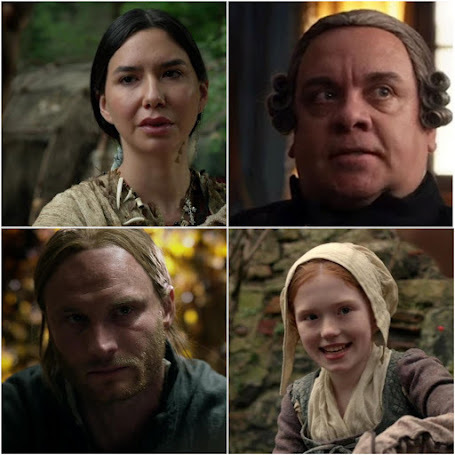 Furthermore, Jamie suggests outright that Jenny and Ian don’t understand their son and that he is the only one who is showing him the ways of the world. It can, and in fact has, been argued that this makes Jamie sound quite arrogant, critical and not at all honourable. While no one, not even the King of Men can be a perfect human being, this represents quite a personality shift and it is difficult to reconcile with the Jamie Fraser who has been on the show, up until this point. But then again, we are only halfway through the season, so it remains to be seen what will happen going forward! 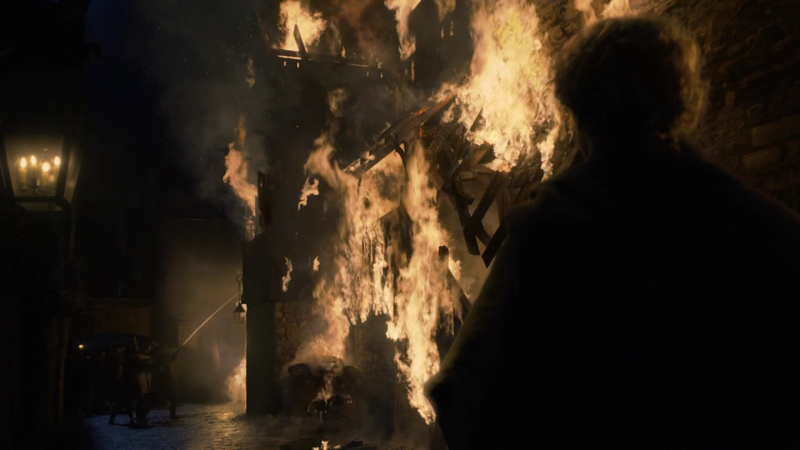 By the time Jamie and Claire arrive at Carfax Close, the print shop is ablaze. Knowing that Young Ian sleeps at the back of the shop, Jamie races inside. He finds a barely conscious Ian overcome by smoke on the downstairs floor, and reaches him with an amazingly agile - almost Batmanlike - leap. The flames are building and ways of escape are diminishing with every passing second. In true Superhero fashion, Jamie pushes the printing press over to the wall to give him access to the upper level after the stairs have collapsed. 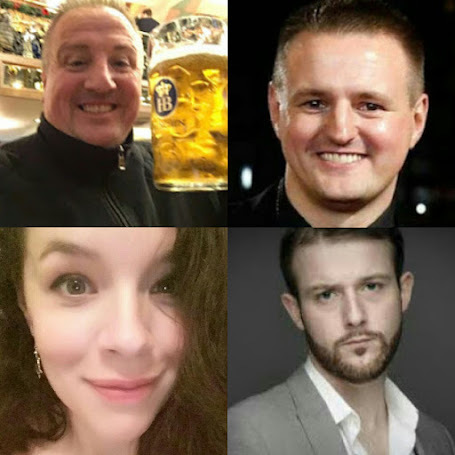 Throwing Ian over one shoulder, and clutching the rescued portrait of Willie, Jamie escapes the shop with only seconds to spare, to the immense relief of Claire who has been anxiously watching, along with Fergus and Willoughby. It is an interesting continuity error that Claire calls out “Jamie!” twice, when she should have been maintaining his cover as “Alexander”. Presumably, in all the drama, no one notices! 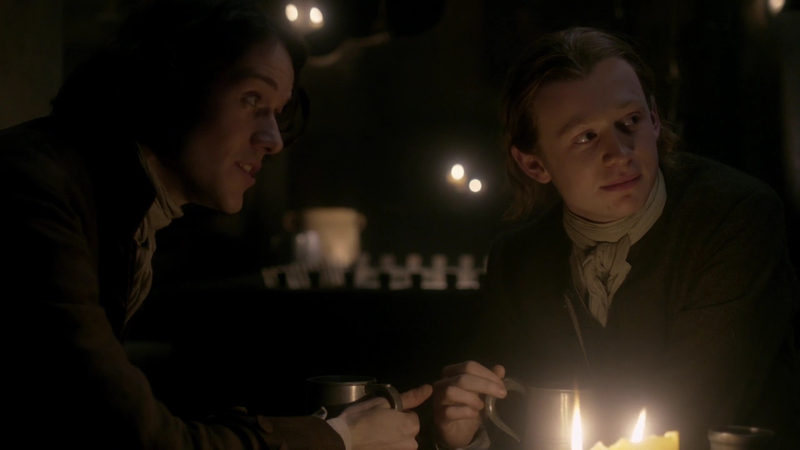 As the two recover, Young Ian tells Jamie about Sir Percival’s companion and how he had discovered the pamphlets. This is distressing news, as Jamie can now be arrested for the capital crime of sedition if the pamphlets reach Sir Percival’s hands. Fergus asks what Jamie plans to do and he responds that he will leave at once to take Young Ian and Claire to Berwick. But Claire insists that Young Ian must be returned to Lallybroch instead, where he will be safe. Jamie reluctantly agrees, musing that Sir Percival won’t be able to trace him there. He gives Willoughby the profits from the most recent cask sales, asking him to deliver Lesley and Hayes their share and warning him to stay out of sight, as there could be a target on Willoughby’s back as well as his own. To Fergus, Jamie gives his own share of the profits, and asks that Fergus try and intercept the print shop intruder before he gets to Sir Percival. He also asks Fergus to tell Ned Gowan to bring word of the other matter he had enquired after. 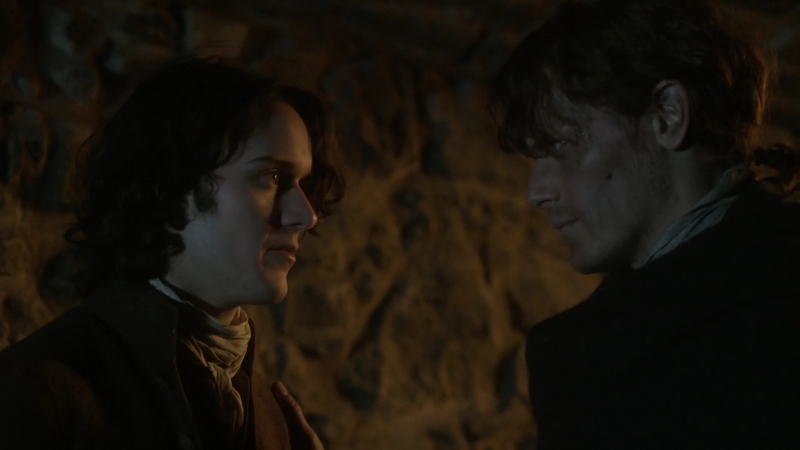 Fergus asks if there is a better place to take Claire, but Jamie tells him not to worry, saying mysteriously that “Balriggan is a long way from Lallybroch”. At this point, the biggest hint is dropped as to Jamie’s ultimate secret, with Fergus asking if Claire knows about Jamie’s other wife. Jamie says that he will tell her once she and Young Ian are safe and the two men part. The episode ends with Jamie watching the final destruction of the Print Shop. It is yet another loss, with both his latest identity as Alexander Malcolm, printer literally going up in smoke before his eyes. This was a controversial episode to be sure, with many debatable moments discussed amongst fans. 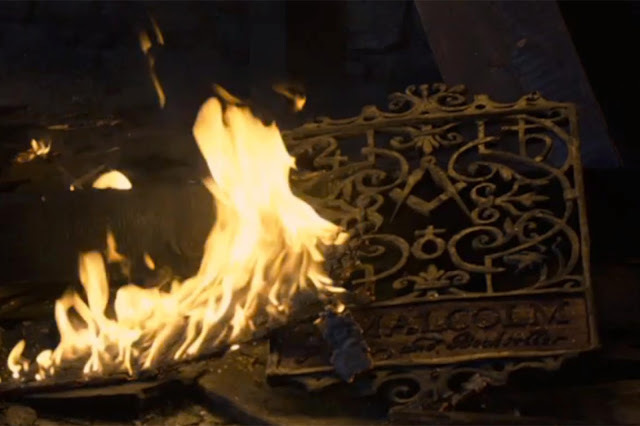 While it was certainly action packed and well acted, it can also be argued that in this case, the book was, like Jamie, living very much “in the shadows.” With book readers knowing what is surely to come in episode 8, speculation is mounting as to what this next adaptation will look like. 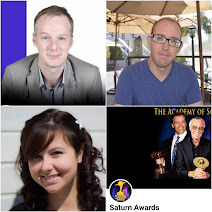 This episode recap was written by Susie Brown, a teacher-librarian and writer who lives in Australia. She admits that she wasn’t a fan of TV Jamie’s lie to Ian, but is determined to try and appreciate every adaptation as she strives to understand the reasoning behind the changes! I'm very curious about the look between Claire and Yi Tien Cho after Jamie enters the room. Did she deliberately kill him? Suppose for a surgeon, would have been simple even with Mr Cho looking on. Also spotted the error where Claire kept using Jamie's name instead of Alexander but, I concur, too much excitement for anyone to notice! Looking forward to seeing how rest of season pans out. "the book was, like Jamie, living very much “in the shadows.” Well said! That is a great way to express this problem that's emerging with the show.